Loud noises, a constantly ringing doorbell, kids in costumes. All of these things can spell fear and anxiety for your pet this coming Halloween. But here are some Halloween safety tips to ensure your pet’s safety so that you can be certain everyone will have a scary-good time! Keep dogs leashed or crated if they are anxious or easily frightened/excited. With the doorbell ringing constantly throughout the night, you run the risk of your pup potentially jetting out of the front door. By keeping them on their leash or in a crate, you can eliminate that risk. If you’re bringing them trick or treating with the family, keep them on a short leash close to your body to minimize the risk of them lashing out at someone in a costume they find particularly scary. Make sure their ID info is easily found and up to date. If the worst happens and your cat or dog gets out of the house on Halloween, having a collar with an up to date ID tag will at least help whoever finds them get in contact with you. If your pet is microchipped, make sure the information attached to that is updated as well. We even recommend buying a glow in the dark collar, or something highly reflective so that your pet can be easily spotted. 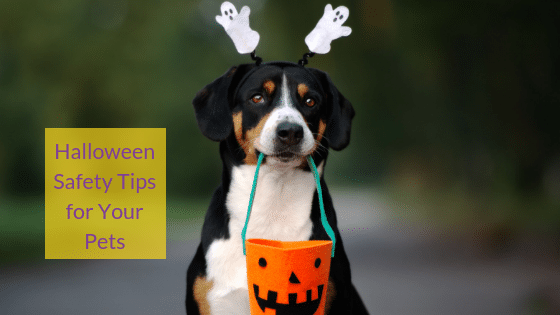 Keep candy far out of your pets reach. This kind of goes without saying since most pet owners know that chocolate is deadly for dogs, but it’s deadly for cats too so make sure you keep your kitty out of the candy bowl if they get curious. Other types of candy can be dangerous too, as a lot of Halloween candy is small and hard and can pose a choking hazard to pets. If you suspect your pet has ingested candy, keep an eye out for these symptoms: vomiting/inability to keep food down, constipation, blood/mucous in the stool, sudden weight loss, refusing food, overall weakness, etc. These symptoms can take anywhere from an hour to a few days to manifest, but if you see them contact your veterinarian ASAP. Don’t force them the dress up. Yes, some pets don’t mind being put into a costume. But if your pet doesn’t enjoy it, don’t force them to wear one. We know it’s super cute but forcing them into costume can result in destructive behavior. If your pet doesn’t seem to mind the costume, make sure what you’re putting on them is pet-safe. Only use costumes made specifically for pets. Look for any small objects, tags, laces, or strings that can be chewed on and any areas that could possibly become snagged on something and cause your pet to be trapped somewhere. Always keep an eye on your pet when they are in their costume, and if you leave the house be sure to remove it. Keeping the house clean during and after the festivities is super important. Shiny candy wrappers and lost costume accessories are very appealing to dogs and cats alike. If these items are left lying around, you run the risk of your pet ingesting them and becoming seriously ill. If your pet does eat something and become sick, monitor their symptoms and take them to the vet if necessary. It’s important to be aware of the item that’s been consumed so that your vet can take the proper action. Most times, they will require and ultrasound or an x-ray to determine what the object is should your pet not be able to pass it on their own. With these Halloween saftey tips everyone, including pets, can have a happy and safe Halloween!